We searched, we analyzed and we debated, but we finally found the most fabulous, elegant, are-these-really-wedding-cake cakes to inspire you for your upcoming wedding. And don’t worry, if cakes aren’t your thing, we found the best alternatives to traditional wedding cakes. Our comprehensive guide includes everything from immaculate photos to DIY fondant tutorials to gluten-free cake recipes. We thought of it all. 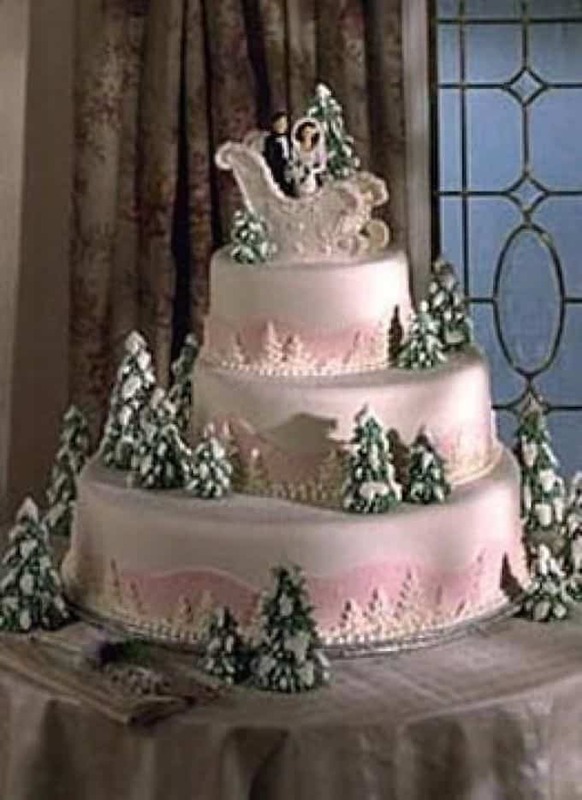 Let the fun begin and explore the wedding cake ideas together. 1. AK Cake Design created this simple, yet incredibly elegant, black and white wedding cake with two white roses. For the timeless wedding with a simplistic feel, this cake is a winner. 2. Popular colors for a wedding in any season, this enchanting pink and grey wedding cake will complement your wedding perfectly by Beverly’s Best Bakery. Make wedding cakes that look like they came straight from a bridal magazine. Create three on-trend designs that can be customized for any bride. 3. 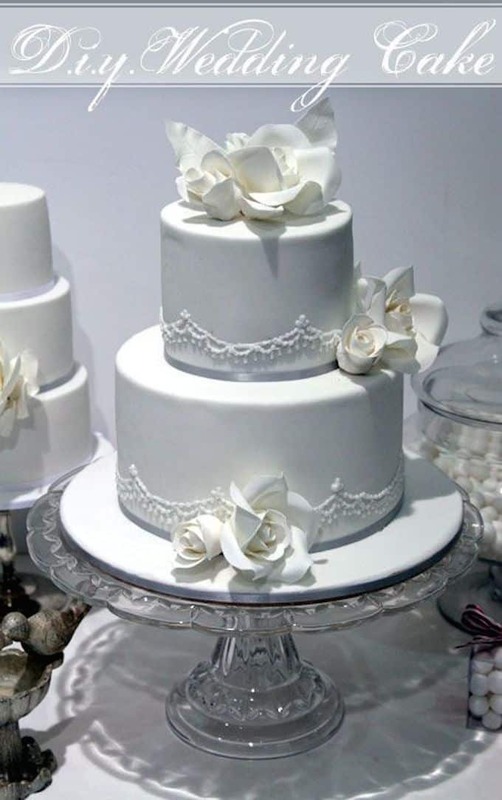 This classic ivory cake with three tiers, hand-crafted light cream roses and a white ribbon surrounding the bottom tier is simply gorgeous by Beverly’s Best Bakery. 4. 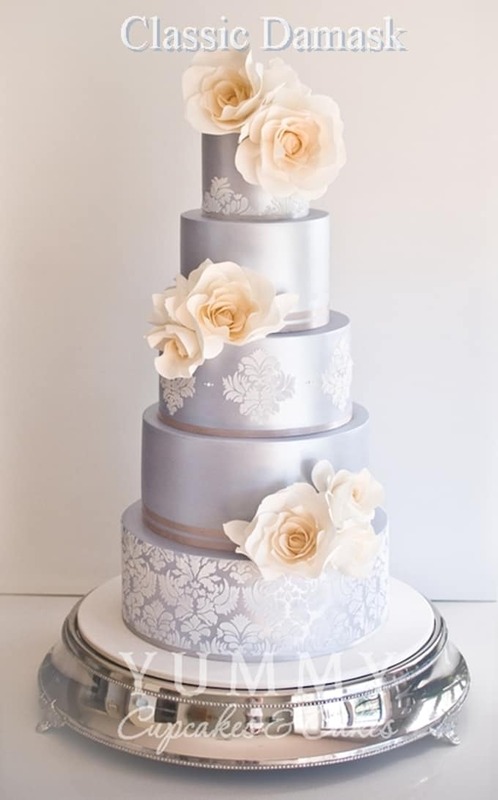 Yummy Cupcakes & Cakes does it again with this five tier class silver cake with ivory roses and floral stenciling. 5. This handmade buttercream cake was made without the use of fondant. The white roses were all made by hand as was the stenciling on the top and middle tiers by Sweet Art Bake Shop. 6. This lace wedding cake is wonderfully romantic and the lace pattern matches the most popular used lace on wedding gowns. Simply gorgeous by Gateaux Inc.
7. The details on each rose on the top and bottom tiers make this blush wedding cake pop. Found at Wedding Inspirasi. 8. This immaculate white-and-silver wedding cake features scalloped details along with silver and pearl strewn throughout by Sugar Ruffles. 9. 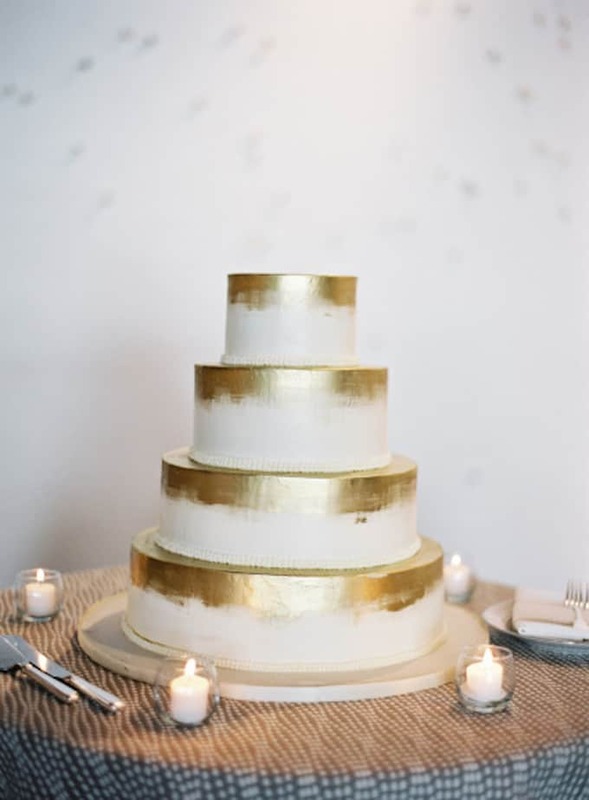 A traditional cake made unique with smaller, sparkly gold tiers separating the main white tiers. Add in some vintage roses between the tiers and you’ve got an immaculate, one of a kind beauty by Laura’s Bakery. 11. Crème-colored pleats, silver pearls and two big flowers signify the beauty in this four tier cake by The Pastry Studio. Photography by Leah Jean Photo. 12. This black-frosted fondant-style cake screams elegance and sophistication. Topped with white and gold flowers, this wedding cake will surely turn heads at your wedding by Bloom Cake Co.
13. This unique cake was inspired by the stunning dresses of Jenny Packham. Designed with custom coloured pearls and a touch of sparkle, the cake is chic while still making a statement. Found on Bobbette & Belle. 14. We love weddings that look like they’re straight out of a fairytale. 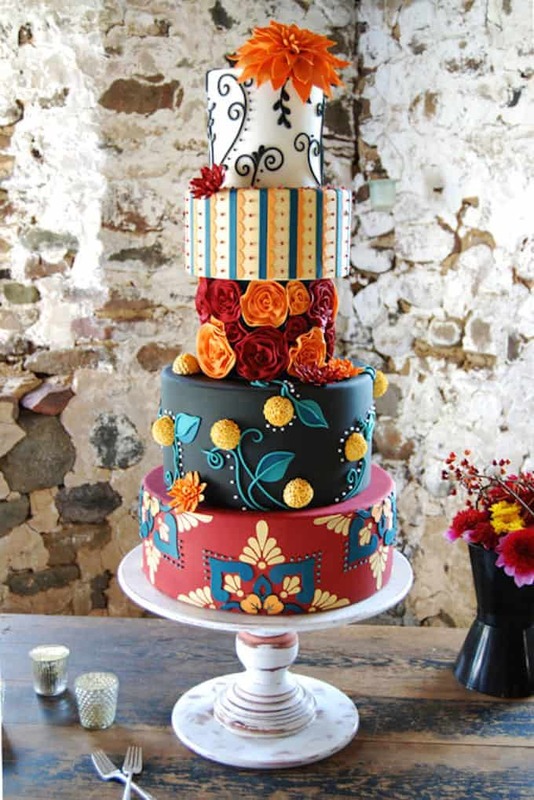 This whimsical cake by Sugar Smith blows us away with its stunning beauty. 15. Created by Bliss Pastry, a cake doesn’t get more divine than this fruit and floral cake. 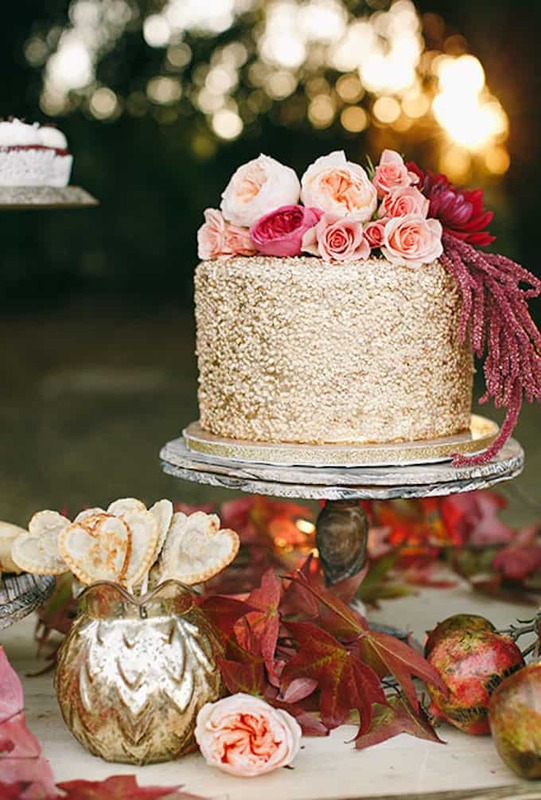 The colors, the details of the fruits and flowers, the glitter on the top tier—we’re guessing the newlyweds had a hard time cutting into this timeless beauty. 17. This cake by Jay Qualls perfectly portrays the back of a long, beautiful wedding gown. It’s so elegant it’s almost too pretty to eat. 18. Another cake by Jay Qualls is this floral cake that is customized to match your wedding flowers. The real flowers surrounding the bottom of the cake add an elegant ambiance and make the cake a bit more personalized to the wedding. 19. Equal parts enchanting and whimsical describe this charming cake perfectly. We love have each tier is different, yet they all fit perfectly together—just like a couple embarking on the journey of marriage by Gateaux Inc.
20. If you’re looking for a cake that’s a bit out of the box, you’ll want to give this geometrical cake with multiple shapes another look by Beverly’s Best Bakery. 21. Does a cake get any more beautiful than this three tier cake covered in different colors of roses? We didn’t think so. 22. Don’t miss this cream-colored wedding cake with a layer of colorful butterflies cascading down the cake. 23. 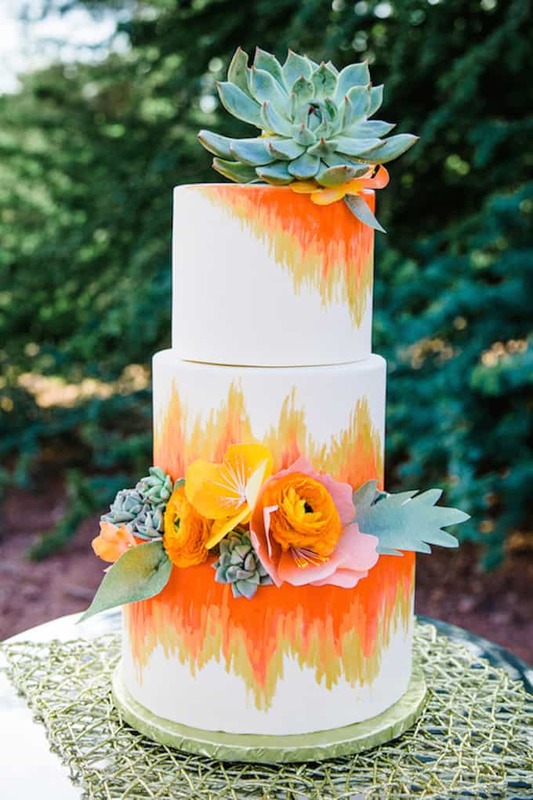 If you live in the South don’t miss this precious Boho wedding cake that resembles an Arizona sunset by Caketini. 24. This black wedding cake with pops of pastel flowers is perfect for elegant evening weddings by Cake Heart. 25. We love this ombre blue ruffled cake from Flutterby Bakery. Each ruffle is handcrafted and the entire cake has remnants of dark pink roses throughout. 26. This smooth, two tier white fondant cake is made complete with red and white striped ribbon on the bottom of each tier and topped with a single handcrafted red flower by Coco Cakes. 27. Elegantly Iced thought of every little detail for this lace and cascading florals wedding cake, and it shows. Each elegant detail truly transforms this cake into a masterpiece. 28. 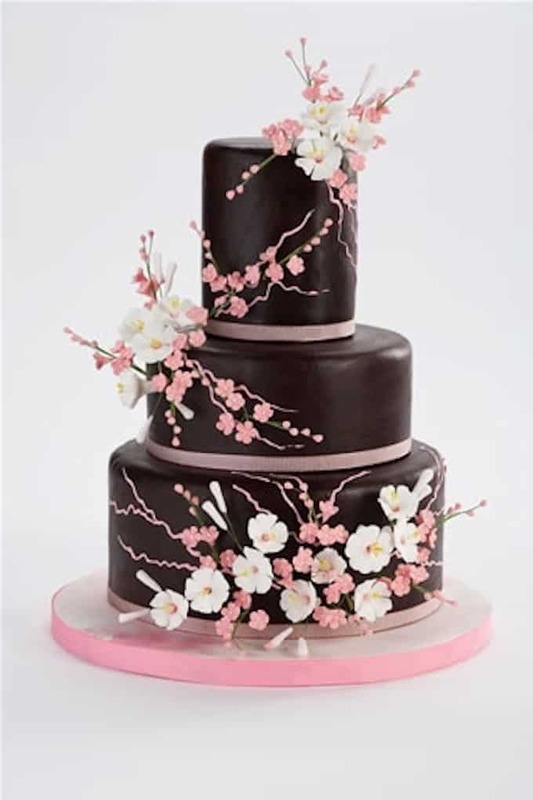 This black fondant floral cake from Lulu Cake Boutique isn’t your typical wedding cake, but it sure is lovely. 29. If you’re looking for a unique wedding cake, try this two tier gold pillow wedding cake by Faridah Cakes. 30. Check out this four tier, watercolor and tie-die pleated cake. Customize the colors to match the colors of your wedding by For Goodness Cakes. 32. Fit for only a king and his queen is this deep purple royal wedding cake topped with a crown. 33. This wedding cake should almost be placed in a museum, it’s that beautiful. We can only imagine the work that went into creating a cake of this magnitude by Nevie-Pie Cakes. 34. 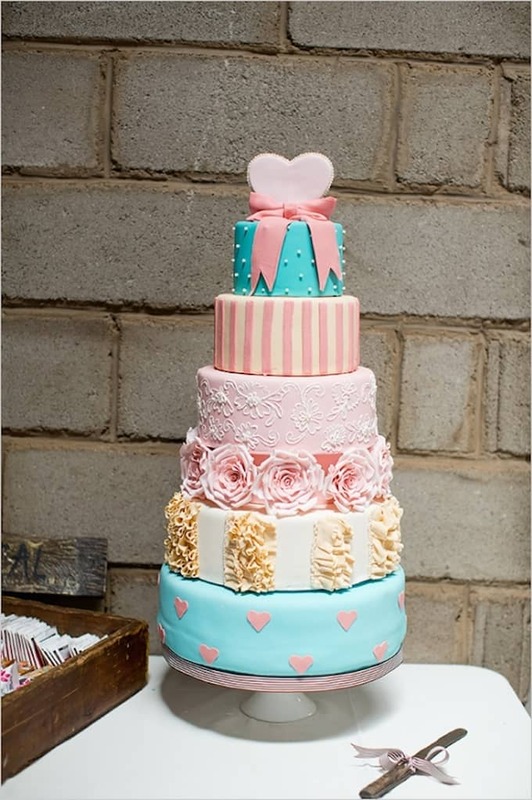 Stumped on what type of cake to get for your big day? Try this amazing unfrosted, two-tiered chocolate wedding cake to make a statement on your wedding by Lael Cakes. 35. 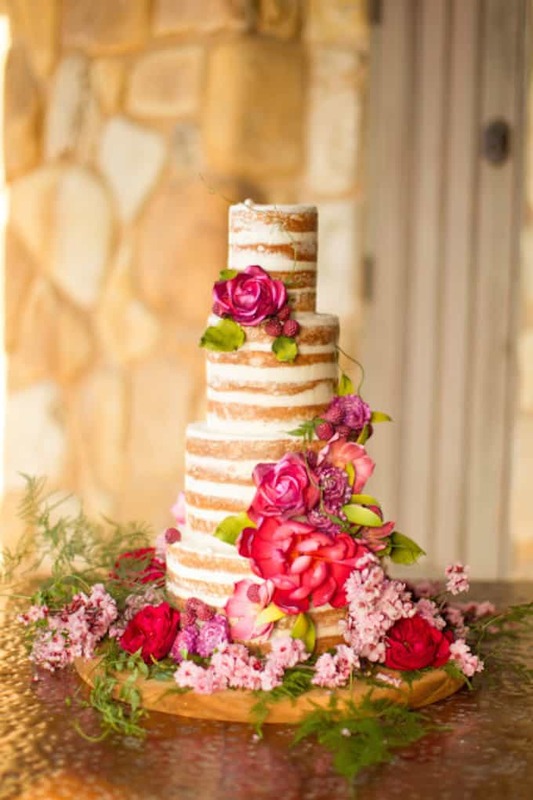 Naked cakes seem to be all the rage lately and we can see why. Check out this simple wedding cake made majestic with berries, flowers and a dusting of powdered sugar by Sugar & Chic. 36. This sophisticated naked black and white cake by M Cakes Sweets resembles stacked Oreo cookies. We love the look and can only imagine how good it tastes. 37. If you’re having an outdoor, summer wedding, take a look at this three-tiered naked vanilla cake topped with fresh berries by The Sugar Suite. 38. 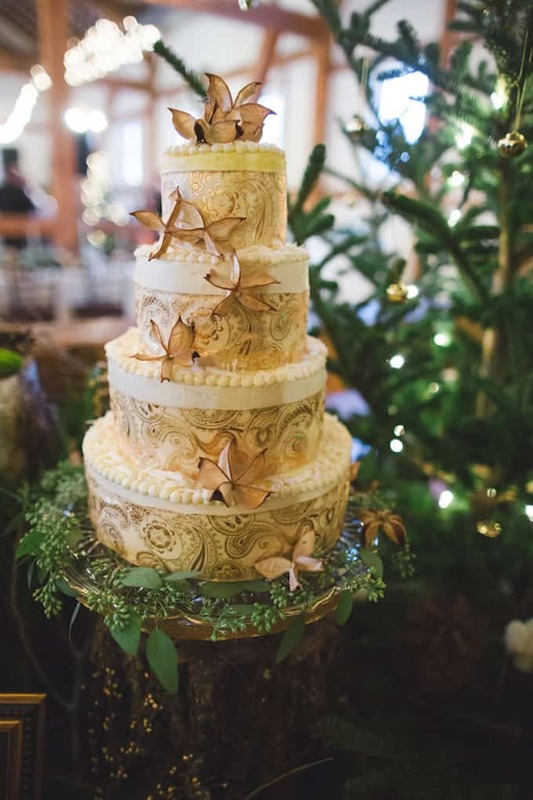 To say we’re obsessed with this floral and gold wedding cake would be the understatement of the century. Topped with fresh blooms and painted with water colors, this cake is bright, happy and full of colors by Cake Ink. 39. Made by The Sugar Suite, this country-chic wedding cake is bright and happy, perfect for the Southern couple getting married in the spring or summer. 40. It’s your wedding—who says you have to have a traditional cake? Why not think outside the box and create something unique for your big day, such as this poolside polka dot cake perfect for an outdoor, summer wedding.